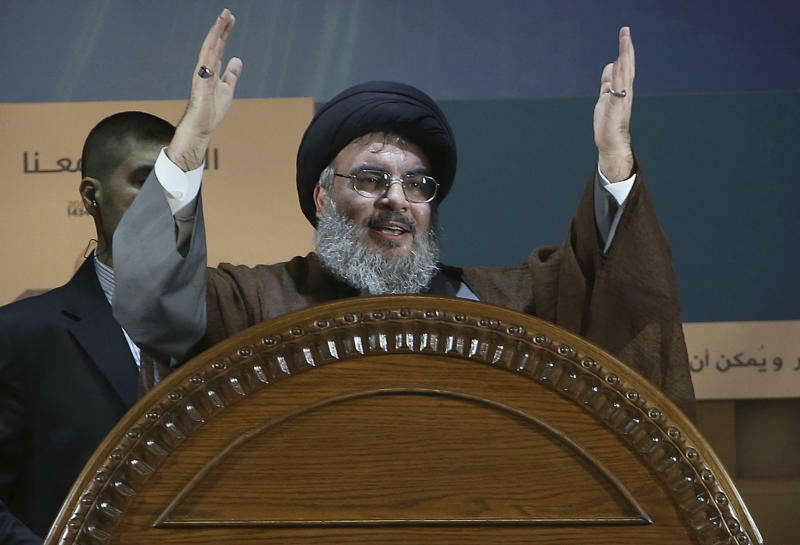 BEIRUT (AP) — The head of the militant Hezbollah group in Lebanon warned Israel late Saturday over its continued attacks in Syria, saying a miscalculation could drag the region into a war. Nasrallah said Iran, Syria and Hezbollah could "at any moment" decide to deal differently with Israel's actions in Syria and hinted that Tel Aviv might be a target. Addressing Israeli Prime Minister Benjamin Netanyahu, he said: "Be cautious. Don't continue what you are doing in Syria. Don't miscalculate and don't drag the region into a war or a major confrontation." Israel has recently increased its attacks on suspected Iranian military targets in Syria, confirming such targeting in a shift from its longstanding policy of playing down or not commenting on its military activities in the war-torn country. Israel considers Iran to be its greatest enemy, and it has repeatedly warned that it will not allow Iranian troops — who have been fighting alongside Syrian government forces — to maintain a permanent presence in postwar Syria. In the latest violence, the Israeli military claimed responsibility for a series of airstrikes on Iranian targets in Syria last Monday, saying it was responding to an Iranian missile attack a day earlier. The Iranian launch followed a rare Israeli daylight air raid near the Damascus International Airport. Nasrallah said Israel has failed to realize what he said are its goals in Syria: undermining the Syrian government, forcing Iran from Syria and preventing Hezbollah from acquiring precision missiles. He also said Netanyahu is the person "most disappointed" by U.S. plans to withdraw from Syria and cited the pullout as another "failure." Nasrallah's appearance followed news reports in Israel and elsewhere that his health was failing. He dismissed the reports as "lies." "I don't suffer from any health problems," said Nasrallah, who seemed relaxed and at times joked with his interviewer and sipped on tea and water. "I have been active, and I also lost weight," he said with a giggle. The Hezbollah leader regularly addressed his supporters and made TV appearances about pressing issues in the region and Lebanon. But the 59-year-old Nasrallah, who has led his group through different wars with Israel for nearly three decades, had not appeared since November despite Israeli escalation in Syria and along Lebanon's borders. 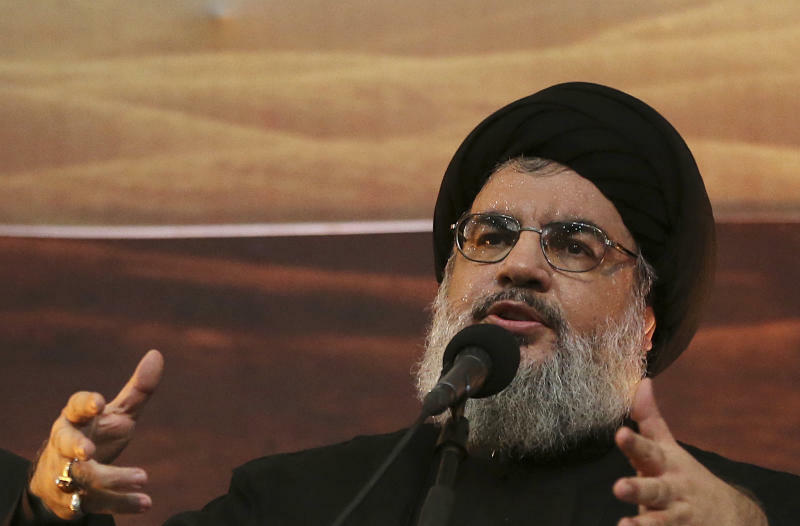 Nasrallah described his silence as intentional, saying Hezbollah chose not to address Israel's attacks so as not to feed what he called an Israeli "publicity stunt." In December, the Israeli military launched "Operation Northern Shield" to detect and destroy what it has described as a vast network of Hezbollah tunnels built for militants to sneak across the border into Israel, capture territory and stage attacks. Israel discovered at least six tunnels, which it said were Hezbollah's prime strategic investment for its next potential war. In the first comments about the tunnel operation, Nasrallah played down the discoveries, saying Hezbollah would need more than a few tunnels if it ever decided to invade Israel. He also said at least one of the tunnels was built more than a decade ago. "This is a 13-year-old (Israeli) intelligence failure," Nasrallah said.